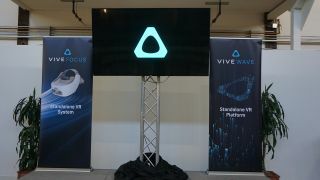 The headset will be available starting today in two incarnations: a base package that will sell for $599 (around £460, AU$825), and a Vive Focus with Advantage (HTC's version of Apple Care) for $749 (around £570, AU$1,000). "It takes VR out of the hype cycle and into the practical use cases," says Dan O'Brien, General Manager of HTC America. "And, that's great for VR." While HTC's PC-based VR headsets, the HTC Vive and HTC Vive Pro, seem to be squarely focused on gaming – thanks to a software partnership with Steam – HTC is playing up the Vive Focus's industrial applications. Pursuing enterprise VR customers could be a risky venture for the company but, considering how crowded the gaming space is becoming with new devices from Oculus, Google, Lenovo and more, this move might work to HTC's advantage.